Think of your heart, the central part of the human body, as a tool that conducts energy not only for you and to you, but also conducts it out away from you. Energy is something that moves through things, into things and out of things. The energy that is created within your heart can be moved to other places. 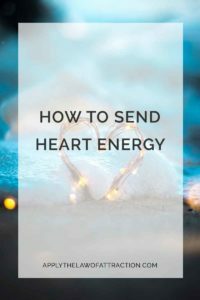 You can send out heart energy in such a way that it touches others. Try seeing heart energy as a ray of light, as a stream, or as a spiraling silver line coming from your heart and traveling out to someone in front of you…or if you prefer…to an animal or an object..
You may not see that the energy touches the other person, but it does. If you do not send out heart energy to others, they cannot receive your feelings of goodness and beingness, and it will not inspire them to do more, to trust or to be what they can be. So trying to send out these spiraling rays, this love-filled energy, these waves of light and spiraling love from your body to others will help them become better. The more that you can trust your ability to do this, the more you will automatically send and provide this energy and information out to others. Allow yourself to attempt to do this many times during the day and you will see that sending out heart energy will become easier and easier to do.